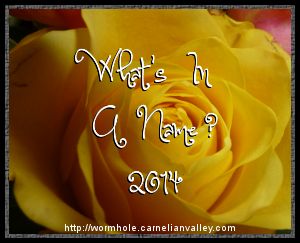 The What's In A Name? 2014 Challenge is hosted by Charlie at The Worm Hole. The challenge runs from January to December. During this time, read a book from each of the following categories. Examples of books you could choose are in brackets. Remember — the titles given here are only examples. You can, by all means, use them if you want to — some are classics after all — but it’s not necessary. There are plenty of other books that will fit the categories. You may have some in mind already, or even some on your shelves you can read. For more info and to sign up, go to The Worm Hole. I will track my progress on my Challenges page. Foodies Read 2014 is hosted by Vicki at I'd Rather Be At The Beach. If you are new to a food/reading challenge, you may be wondering – what is a “food book?” A food book is a book which is centered around food and/or drinks. That could be a cookbook, a food biography or memoir, a non-fiction book focused around a specific food, wine, chef or restaurant, or a fictional story in which food plays a major role. For more info or to join, go to the Foodies Read 2014 blog. In 2014, I shall become a Sous-Chef. I will track my progress on my Challenges page. The 2014 E-book Challenge, hosted by Workaday Reads, encourages readers to expand past just physical books to embrace e-books in all forms. 1. This challenge will run from Jan 1, 2014 – Dec 31, 2014. 2. Any genre or length of book counts, as long as it is in e-book format. For more info, and to sign up, go to Workaday Reads. My goal for 2014 is to be a DVD. I will track my progress on my Challenges page. This challenge is hosted by Lori at Escape with Dollycas into a Good Book. For the Alphabet Soup Challenge, by December 31, 2014, the bowl must be full — one book for each letter of the Alphabet. Each Letter Counts As One Spoonful. The challenge is to read one book that has a title starting with every letter of the alphabet. You can drop the A's and The’s from the book titles. Books can be read in any order. All formats – print – e-book – audio – are acceptable for this challenge. Click here for more details, and to sign up. I will be filling my bowl of alphabet soup on my 2014 Reading Challenges page. I participated in this challenge in 2013. Cozy Mysteries are my favorite genre, so I am signing up again. This challenge is again hosted by Yvonne at Socrates' Book Reviews. 2. The challenge runs from January 1, 2014 and ends December 31, 2014. 3. Books can be in any format - paper, audio, ebooks.... It all counts! For more info, and to sign up, go to Socrates' Book Reviews. For 2014, I shall be a Sleuth Extraordinaire. 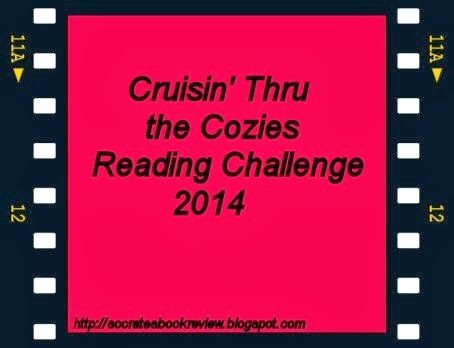 I will list the cozies I read on the 2014 Reading Challenges page. 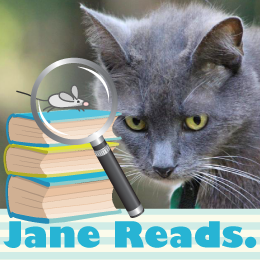 Welcome to the Jane Reads stop on the book tour for Heartache Motel! I have three special guests for you today — the stars of each novella of Heartache Motel. My first guest is from LynDee Walker's Headlines in High Heels Mystery series. Please welcome intrepid newspaper reporter Nichelle Clarke of the Richmond Telegraph.